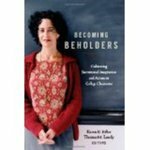 "Becoming Beholders: Cultivating Sacramental Imagination and Actions in" by Thomas M. Landy, Karen E. Eifler et al. Landy, Thomas M.; Eifler, Karen E.; Harkins, Angela Kim; and Pagano, Michael P., "Becoming Beholders: Cultivating Sacramental Imagination and Actions in College Classrooms" (2014). Religious Studies Faculty Book Gallery. 47.